Actuarial professionals are involved in calculating out uncertainty and risks of financial security plans, focusing on their mathematics, complexity, and mechanisms. In simple words, they analyze the reserves and premiums of varied insurance policies that cover different risks. You can also see Nutritionist Resume Templates. The actuaries work for insurance firms and also offer their expert ROI analysis for companies contemplating on a new investment. 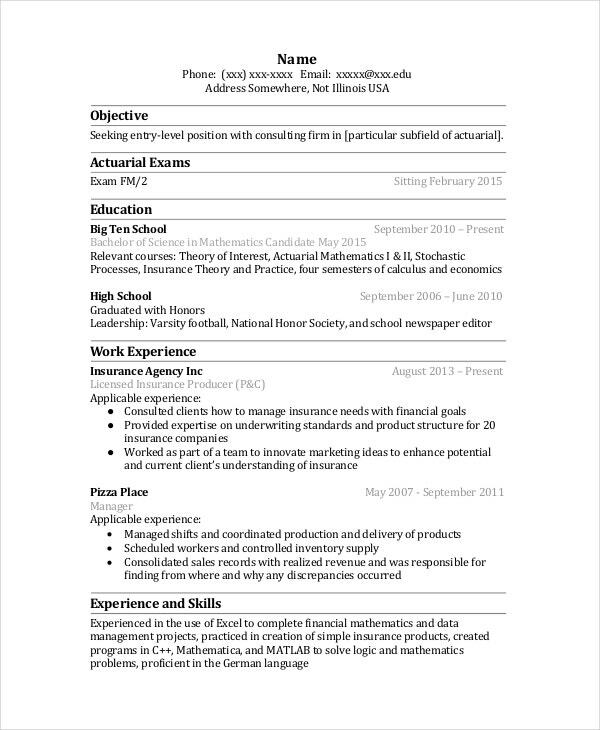 Are you an Actuarial professional looking to create your resume? If you need ideas on a standard format of such business resumes, there are specially drafted actuarial Resume Templates for your convenience. You have a smart Actuarial resume template here that starts with your phone and email id, followed by qualification summary and then your professional experience and educational qualification in proper bullet points and chronological order. 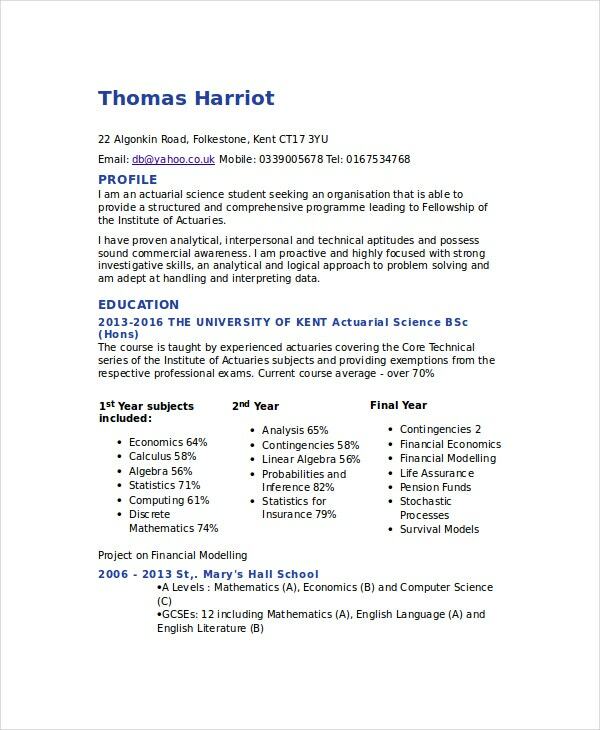 You have a compact resume template here for those who have studied Actuarial Science and now working as Actuarial analysts. The resume has space to include everything from internship to awards to relevant skills. 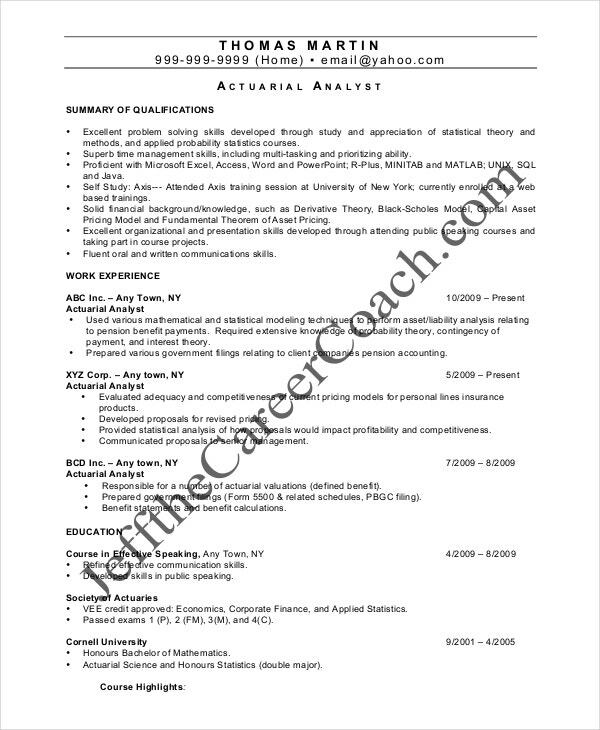 This Actuarial Intern resume template starts with education and Actuarial exams that the candidate has passed as the applicant has not gathered much work experience yet. Then, it also mentions relevant coursework and relevant computer skills or research experience. As the Actuarial resume template here is for an entry-level candidate, it mostly talks about the Actuarial exams passed by the candidate and educational qualification. Starting with the resume objective, it also offers space for the few work or internship experiences the candidate has gathered. You have an elaborate Actuarial CV template here that will allow you to highlight your educational qualification with the percentages you have gathered in every subject – and also enables you to offer a brief summary of each of your skills. > What to Include in an Actuarial Resume? It would be great to start your Animator Resumes with a compact profile that will summarize your ambitions, background, and achievements. Then, if you are a seasoned Actuarial professional, you must include your professional experience as well as your educational qualifications. You have to include the Actuarial exams that you have passed in as well. Then, don’t forget to include the relevant computer and technical skills which you have gathered for your actuarial profession. Besides, there must be a separate section for the professional and personal skills. Finally, yes, no CV is complete without personal details like name, address and other contact details such as phone and email id. > What are the Tips for the Best Actuarial Resume? Most of the resumes usually put professional experience ahead of the education qualification but it should not be so with actuarial resume. You must know that your hiring manager is more interested in your education, degree & training as a trained Actuary- and hence you must place your academic qualifications before the professional experience on the resume. Arrange everything in chronological order. While mentioning work experience, emphasize on particular goals you have achieved along with tangible results. Do mention your language and IT skills in the resume. Place a summary of organization and communication skills. Don’t forget to mention your internship experience with actuarial or insurance firms, if any. 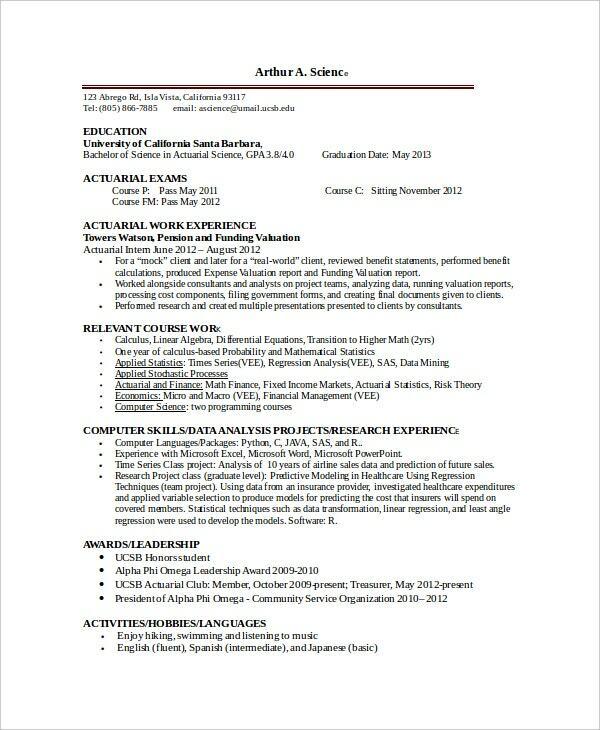 You can also see Software Engineer Resume Templates. > What are the Mistakes to Avoid in Actuarial Resume? 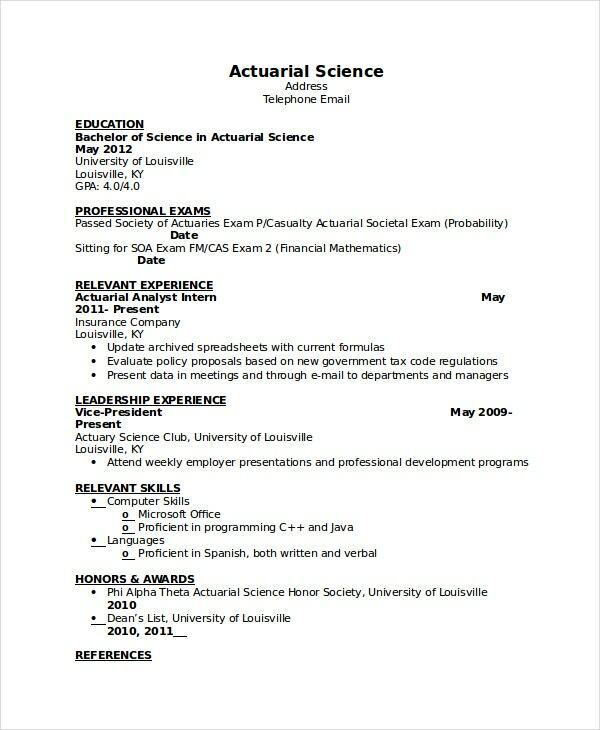 First of all, don’t make your Actuarial resume too long, try to complete it within 2 pages. Then, make sure your resume is free from the grammatical, spelling or typo mistakes. Always double-check very point of the Software Engineer Resume Templates before sending it. 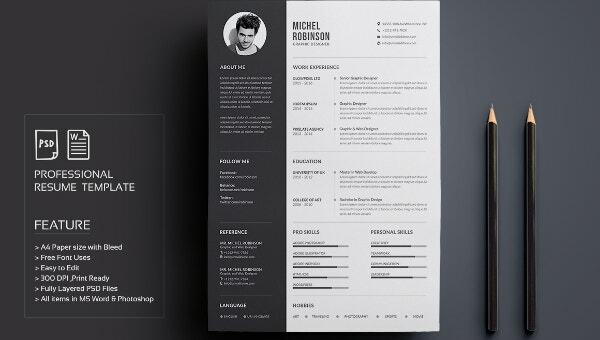 A lot of people do not focus on the aesthetics of the resume and end up cramming it badly. Arrange every point in bullet format with proper subheads and maintain adequate white space. Then, please do not make the mistake of stuffing up your resume with generic words- your hiring managers want actionable phrases that can actually prove you to be a highly potential candidate. Your Actuarial resume is your primary representative to the hiring managers and hence must be presented in the best professional manner- that will highlight your candidature in the most impressive way. Why don’t you go for modern resume templates as mentioned above that are created by experts especially for Actuarial professionals?